Created by will on Jan. 15, 2015, 12:02 p.m.
We're continuing to work on the spam problem that's plagued the forums for the last six months. Most of the stuff they've done is on the back end to make it easier for us to deal clean up the spam as well as collect some data about how they're actually working. We're getting close to rolling out some client side changes that will let you guys take a more active/immediate role in removing the offending posts from the site. If everything works well, that update should hit in the next few weeks, and I'll have more details for you on that then. We've also been considering making some substantial changes to the forums, including limiting the ability of non-premium member accounts to create posts. We just started talking about it, and I wanted to solicit feedback from you guys before we really consider making such a drastic change. If we limit forum posting to paying members only, we would grandfather in non-paying members whose accounts predate the change over so you could continue posting without having to sign up for a membership. My main concern with locking down the forums is that the forums seem to be a relatively popular entry point for the community for new users. People come here to ask questions about tech problems, stuff we've covered, or show off their work, and I'd hate to stifle that. While we have good data that shows that the majority of people posting on the forums are paying members, we don't have any way to tell how many members started as active forum members. Did you come to the forums first or the site? Instead of limiting posts to paying members, perhaps some sort of human vetting of their first post? So that the first time someone creates a topic it doesn't display until it has been read and approved as being real (i.e. not spam). Thereafter one could assume that the user is real and let their posts show until such time as they are proven to be spammers. So basically all new users have a "newbie" flag set until they have successfully posted a reasonable question or contribution. I believe that to be a much more reasonable barrier to entry for new folks than having to pay. I believe that having to pay to post would substantially reduce the number of new participants. @Dr. V: @Tailzo: Building out a queue for non-member posts is a good solution, but not something we can't get done in the short term due to constraints on the engineering team. Edit: changed can to can't. Would it be possible to not let new, non-premium users post threads, links or images until their post-count is higher than (for example) 10 and their account is older than a week? Any spammers would have their posts flagged and accounts deleted long before they could start posting hundreds of threads. It might be annoying to some users, but I've never had a problem with using forums that have had that system in place. It forces people to participate in threads for a while, and if they want to ask something it makes them go look for other threads that might answer their question, posting there instead of posting their own. This helps avoid duplicate topics as well (although I haven't seen this as a major problem on Tested). With this in mind, it would be a good idea to get the forum-search featured somewhere besides the "new to the forums"-thread too. I would honestly think that if you just put a post limit and content limit on new accounts 5-10 posts, before they get approved and move forward. This would prevent the influx of spam for a set number of accounts, as it seems lately its not so a influx in number of accounts used to spam but just a couple account used to spam repeatedly for every 15m for 10-20 hours at a time. Also on the front of allowing the community to help moderate some, to relieve some of the stress on Will, Norm, and staff (cause we all know Joeys to busy prepping/editing awesome videos for us). Would it be possible to add a first line approval flagging for these members with a select set of forum users/mods. Instead of it outright banning/removal of posts have them enter a moderation queue, until official tested staff/mods can make a final decision. This would make things easier from a management point of view in that it should allow you to spend less time looking for groups of posts and users that are potentially questionable and just quickly check and then clear either approve or deny actions. You could also add something for when a user enters moderation for being flagged that if they are a new account, all previous posts go into a semi non visible state, where you to the bulk of viewers public or private, there posts are hidden by default, but not deleted. At least not deleted until a moderation decision is made by tested staff. some of these ideas probably are not quick to implement but have a high probability of improving the forum experience for everyone. While not ostracizing new users that we want and deserve to be here. Could it be possible to have some threads availeble for everyone, and some limited to premium members? When you make a thread you could choose to make it public or limited to premium. I would like to see more non-spam activity. I don't see any reason (outside of spam control) to limit posting. I'd like to see a larger community. If I'm honest, although its nice to feel special as a premium user, having more interaction is more important, and if possible, make only my text glow like laser beams, Thanks. @VacFink: The spam is a big barrier to increased forum-use. 3/4 of the time the valid posts are buried in anywhere from 10 to 150 pages of spam posts. Set everything on fire and embed an IRC channel? How about an extra tick box when posting that say "tick here to post to Rubbish" have it default to ticked. Have anything that ticked go to a hidden folder. @JamesNZ: i think it's all humans posting. @will: I started as a site user first. forums second. I must admit that, after an initial burst, I haven't been active on the forums much because of the spam, but I feel like it would be a shame for non paying members to miss out. I would guess that a large amount of visitors to the site who aren't already premium members may be looking for advice/inspiration/reviews because they don't have a lot of cash. It would be nice to have a premium section in the forum, but if it is a gated community and everyone else is left to battle spammers like some tech version of The Walking Dead I think it would be a shame. @VacFink: I Agree completely, Will seems to indicate that they are addressing spam and asking for separate consideration for additional posting. If the spam can't be controlled first, I would not want to see more forum users, it would exacerbate the already community crippling problem we have now. Suggestion: Make all premium members "mini-moderators". Any non-premium user whose post gets flagged by 3 (for example) or more premium members, gets automatically deleted along with all their posts. Could you set up a registration -post delay? If they register, they have to wait 24 hours for the registration to clear. It looks to me as if these characters are registering, dropping their poop and leaving. Being forced to wait before unloading may make them go to greener pastures. Also maybe hold up registration attempts form India and southeast Asian countries. That seems to be where the crap is coming from. @will: I don't think limiting the forums for Premium is a good idea. "Pay to play" never seems to build a community very well and only seems to work if the "players" are engaged in groupthink activities (like, say... World of Warcraft). 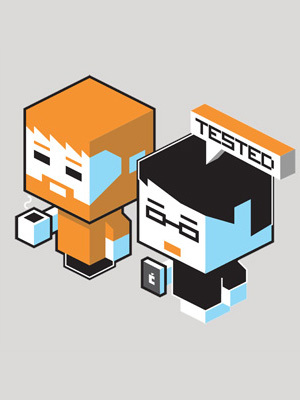 That being said, while I hear constantly via the podcasts to join the Tested community, I don't see a lot in terms of community going on. Very little engagement from those who are trying Tested to us in the first place (but generally Twitter seems like a higher ratio of engagement). The spam situation coupled with the lack of community has really made me think about whether or not renewing my membership is really worth doing. I didn't mind the Premium content but there's been nothing in that really grabs me and make me want to tell others to join for that reason. I like the idea of a registration-delay. Sure, you can make an account and browse everything but until the account is vetted, they can't post new topics or reply. 1. I hope you delete all users with no membership and no posts. (Get rid of sleepers). Other forums do this every few years. Any folks who are real, can re-signup. 2. For the user's first 10 posts, you could require moderator approval for posting if the post contains a link. All the spam has links. No longer auto approving those should stop it. 3. Don't limit to Paying members. How about adding a captcha to new users if they want to create a thread which would go away after a limit is passed? I don't know if this is technically feasible but could you make it so users could only post after viewing a number of videos? Pay walls are a bad idea. I am saying this as someone who is a premium member who isn't very active on the site. Make a mandatory post count before you can start a thread. If you really wanted to kill the spam, make the first posts mod approved. Granted, that would take a lot of time and i understand if that's not an option. Definitely agree, a paywall is not a good solution. Either do two factor authentication on sign up (something you have & something you know) so text a code to people (not too difficult to setup in multiple countries although granted moderately expensive) - or use the solution already suggested (which I totally agree with); setup a queue system. Have the first few posts by a user go through authentication via the other parts of the user base to confirm their validity. Also, you've got a community that includes programmers! Release the framework structure for the site, and I know I personally will happily write a module or two to help the site, especially if it means these forums become useable and more often frequented by the users. Also, have you started deleting posts? Because you deleted my post to a guy asking about coffee in the UK and my recommendation of a local coffee supplier - did this break some rules or did it look like spam? I'm not sure I like the paywall to use the forums. Seems like a bad idea for new members. It would be unfair for them to able to post to this community. There has to been some kind of better solution. To add to the data: I was a follower of the site before I started reading/posting in the forums. I've not been in the forum for a while though, holy spam! that's a lot. I can see why making it premium members only is being considered. When I first came here one of the first thing I did was ghost the forum, mostly because I was surprised that anybody still used forums.... as I ghosted I was pleasantly surprised! Just thought of a simple way to catch most of the spam.A lot of it is dropped into rip and stream, because that's the default forum even create is clicked. So creating a Spam Trap forum that's the new default and isn't visible to us should catch most of the bots.